Our bedroom is the stress-free haven that we relax & escape from everyday life. 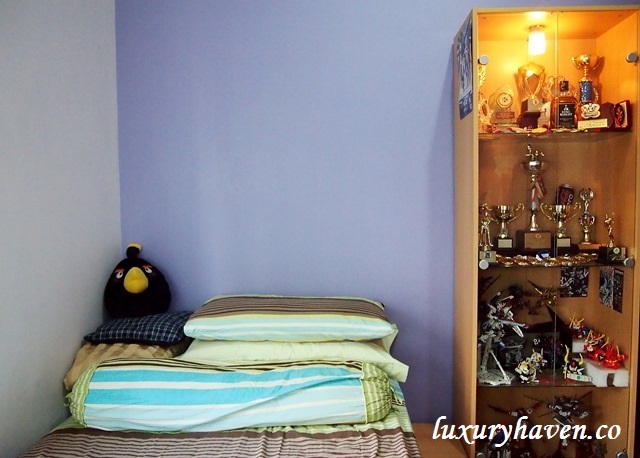 A bedroom should be a private sanctuary with full of soothing colours, soft bedding & plush pillows. After all, bedrooms are made for sweet dreams………. Our Master Bedroom before the make-over. 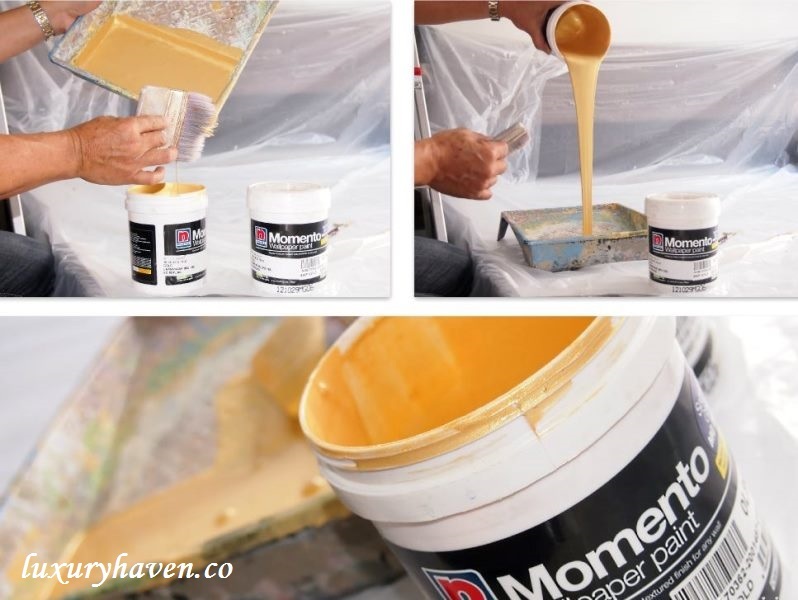 Before painting the feature walls with Momento™ Top Coat, the painters will have to apply the #MomentoPrimer onto the surface. I love flirting with the striking colours of Nippon Paint Momento™. Our master bedroom plays off a shimmering yellow-gold backdrop with the Sparkle Gold series - Champagne (MS 158). What do you think of my colour selection? My master bedroom feature wall was painted using the Delicate Flower Effect. Can you see the flower strokes? Sparkle Gold shimmers with majestic reflection. 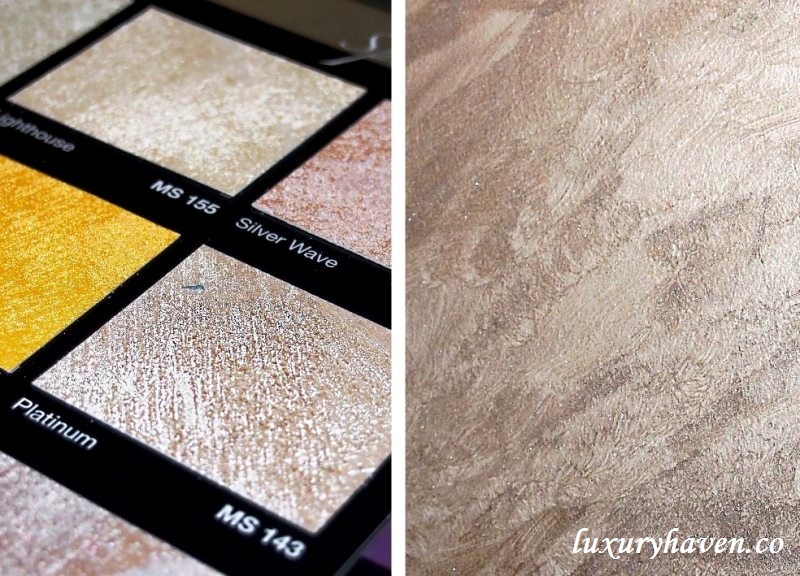 Its unique mixture of glossy-opaque texture & metallic resins creates a spectacular sparkling effect, igniting any wall with lavish brilliance. It's beautiful, isn't it? #NipponMomento is formulated with low Volatile Organic Compounds (VOCs) & contains no lead, mercury, chrome or heavy metals, creating a healthier environment. It’s recommended for interior walls, ceilings, cement based plaster, & gypsum based plaster, brickwork, hard & soft boards & cement fibreboard. Low VOCs: Less VOCs emission. Low odour: Almost no paint smell. Non-toxic solvent: No lead, mercury , chrome of heavy metals. Studies have found that people with blue bedrooms often get more sleep because of the calmness it elicits. Hence, the Momento™ Brish Ocean (MS 132) from the Sparkle Silver series was picked for my son’s room. Jonathan’s room before the make-over. The room after the make-over! Created with glistening radiance in mind, Sparkle Silver embodies unique metallic resins & glossy-opaque textures. 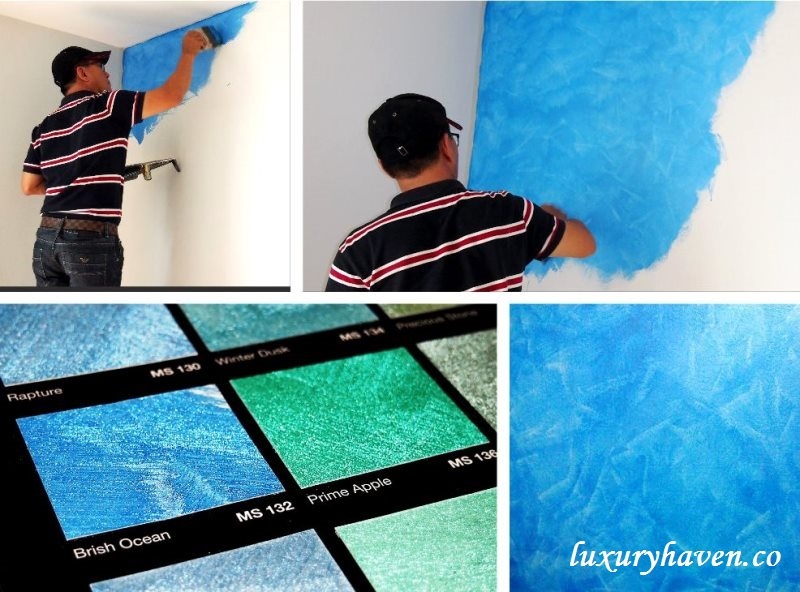 Its iridescent shades provide any room with the perfect colour texture. Jonathan’s refuge was created using the Criss-Cross Effect for the feature wall. The wallpaper effect is electrifying, & it stood out like the blue ocean! My happy boy with Momento™’s Paint Specialist Ah Liang, who had appeared in some home make-over TV programme some time ago. Find him familiar? Our Dining Room before the make-over. While many pay a lot attention to their living room as it’s an area where you sit your guests, I find the dining area equally important especially when you’ve to entertain guests & host occasional dinner parties. I’ve 3 floor-to-ceiling coloured-glasses in my home; a calming green at the foyer, a classy black in the living room, & a sophisticated platinum in the dining area. I like to play it with simplicity & elegance for that space, so I’ve parked a glass table for six plus hanging chandeliers to reflect the lights on the coloured-glass. Before the make-over, my coloured-glass used to be the feature wall for my dining room, but now it’s the eye catching Momento™ Classic Marble Effect Wall with Stripes. I’d selected the Momento™ Platinum (MS 143) from the Sparkle Silver Series to match my coloured glass for the dining room. There’re endless ways to spice up the mood in that area, & now, I’ve added an elegant element of surprise there! Let’s check out the master at work in the clip I’ve put up for you above…………..
Don’t you think my dining room makes an incredible statement with my new feature wall on the other side? 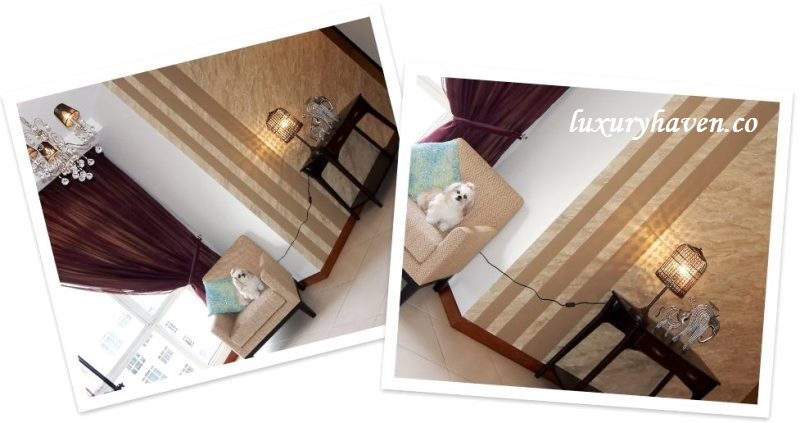 It’s such a cosy corner for a good read too, & Princess Candy is definitely in love with it! I'll be back with the highlight of my Guest/Study Room next. Any idea what colour it'll be this time? Furniture & props courtesy of iwannagohome. Home make-over by Nippon Paint. Ken, you're super fast to arrive at this post! Edmend, indeed I am! Heehee! Reana, thks for the lovely note! That's why I'm retired! Hahaha! The paint effect is superb!~ I love it very much! Kylie, it's a marvellous wallpaper effect! It's Beautiful...Home Sweet Home!!! Love it! EH, hahaha! It's indeed home sweet home! Wonderful, serene and it feels so soothing. What a place to relax. Nava, a make-over changes the entire mood too! Now we've a cosy nest! Love the makeover. Time for me to ditch my plain white walls!!! MM, hahaha! Oops, gonna break the bank soon! The various Momentos color give the feel of having wall paper and it immediately bring out the class in the respectively area. Fabulous! Wow, I like the effect...great colors as well. Juliana, thks & you have a wonderful weekend too! Happy cooking! Its so nice..the texture look is just great. perk up your place. Pepper, it's gorgeous! Thanks to the hard work of Nippon Ppainters! Neha, thks again for sharing your thoughts! I've never had a pink nor purple master bedroom before; that must be sweet! Your home definitely looks bigger and brighter with fresh coats of paints. The textured paint work is something new to me. I like the wall of your reading area now. It looks like marble effects. TM, love the new technique of painting with its special effects! i like the colour combination. superb! cquek, thks & have a good week! omg! How do they do the flower effect? Or does it comes with the the paint and one just need to paint normally? Look so wonderful and beautiful! Hmmm I wonder if I should do this for my new house hmmmm.. (deep in thought). FC, you can scrutinise the "video clip" that I've included above & study the painter's technique. Hahaha! New house coming?? I think you should try Nippon Momento for their wallpaper effect! yup, new house. You mean the photo slideshow near the end of this post right? I looked through at least 3 times. Not easy! They seemed to have used different strokes and painted it diagonally too! Even for your son's room they seems to require diff strokes. Not the normal strokes. That's why they are professional painters. haha. Can't wait to see how your guest room will look like. I am sure it will be awesome too! I agree that a bedroom should have a soothing color. Love the marble effect, Nippon people have given to the paint. looks beautiful! Bal, seems the marble effect is a popular choice. Thks & Happy Weekend, dear! 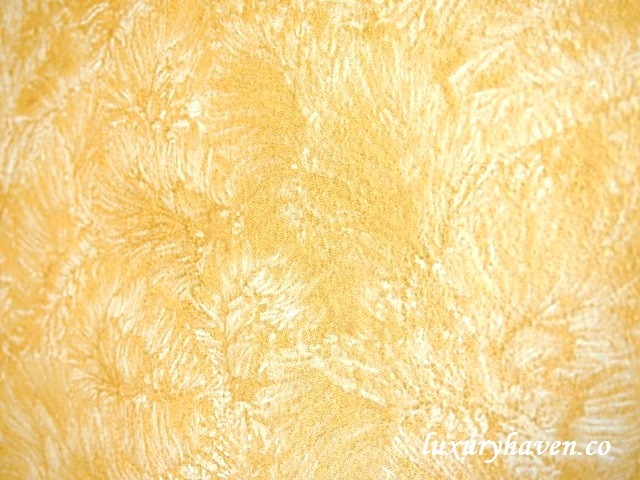 Shirley, your champagne colored bedroom wall is absolutely stunning with that subtle flowered effect. I like how you hung your curtains "straight" after the makeover, too, instead of drawn back -- the lines echo the sleek, elegant room you've created -- a luxury haven! ;) Love it! (I also liked your son's ocean-y looking wall, but you know how much I love sleeping by water, ha!) The accent stripes in your dining room look like "art." Can't wait to see what you cook up for future dinner parties against that gorgeous backdrop! Kim, you're so observant! Since I don't have your luxury of having a house by the lake, guess I could only fake it. Lol! wowowowow!! your house looks like some super luxury housing/hotel..I love the effect especially the gold color effect. how cool it is...It's worth it for me to look at it. thanks for informing me about this post. Hong, you seemed so thrilled! Hahaha! One more room to "show off", coming next!! hi, can share more on how to create Delicate Flower Effect? 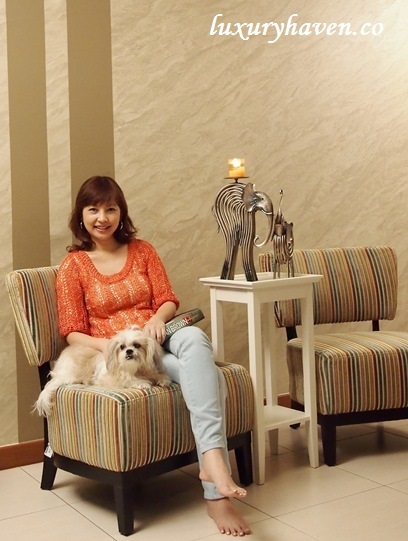 Czlee, perhaps you could check out the post on Painting Cost Of Make-Over + Tips From Nippon Paint! with more links there? Thks for coming by & it's great having you here! Very nice walls you have now! I've dropped u a mail. Thanks! Amanda, got it! Will fwd your details to Nippon Paint. Thanks for coming by & love having you here! 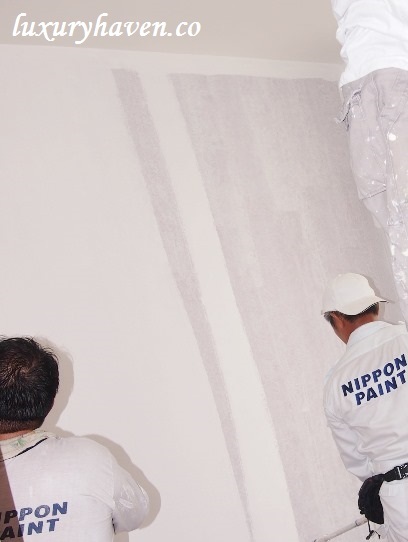 Now I have found idea to follow your wall paints selection instead of using wallpaper as this paint is more long lasting in our humid climate. 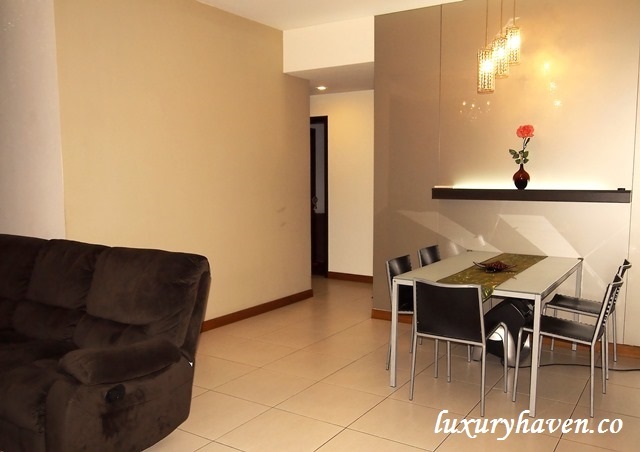 I plan to renovate my condo a bit and rent out to new tenants at higher price. Thanks for your tips. Tan, awesome! I think paint is definitely more lasting. Have fun painting! your home is so beautiful! wonderful photographs...thanks for sharing. Hi there, i really like the flower effect in your bedroom. Mind to share how it done? Just buy the momento paint but getting here to get some ideas on how to paint it. Thanks.